The following blog was first published as part of a longer article in the Whistleblower Edition of Tax Justice Focus (available here). The article was authored by Professor William Byrnes, Associate Dean (Special Projects) Texas A&M University Law. 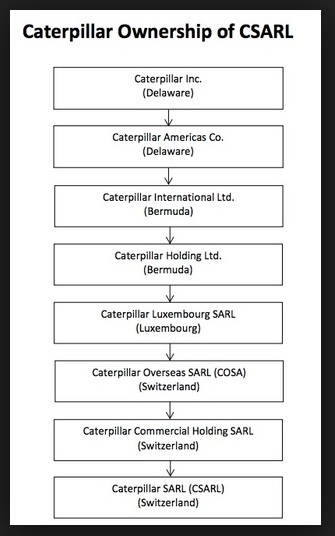 A lawsuit filed by Daniel Schlicksup, a lesser acclaimed whistleblower, may end up costing Caterpillar billions of dollars and a criminal investigation because of its alleged non tax compliant transfer pricing policy. Mr. Schlicksup served as a global tax strategy manager for Caterpillar from 2005 to 2008. During his time at Caterpillar, Daniel Schlicksup assisted Caterpillar establish its European tax department, managed the corporate human resources division, and in March 2005, began working as a Global Tax Strategy Manager. Mr. Schlicksup grew concerned that the substance of Caterpillar’s operating structure did not coincide with Caterpillar’s reported structure for tax purposes. Mr. Schlicksup informed several Caterpillar executives of his concern, including its Director of Global Tax and Trade, and thereafter its Chief Financial Officer and Caterpillar’s General Counsel. Mr. Schlicksup even filed a complaint with Caterpillar’s Ethics Office, which closed the matter. Mr. Schlicksup’s received employee assessments that he considered prejudiced by his attempts to call attention to the potential tax risk. Eventually, in July of 2010 Mr. Schlicksup filed a whistleblower retaliation suit under Illinois law against Caterpillar, which Caterpillar settled in 2012 for an undisclosed amount. The Illinois Whistleblower Act prohibits an employer from retaliating against an employee “for refusing to participate in an activity that would result in a violation of a State or federal law, rule, or regulation. . . .” 740 ILCS 174/20. Under the Illinois Whistleblower Act, an action can be retaliatory “if the act or omission would be materially adverse to a reasonable employee and is because of the employee disclosing or attempting to disclose public corruption or wrongdoing.” 740 ILCS 174/20.1. Hervé Falciani obtained super whistleblower status for downloading from HSBC’s Switzerland bank in 2008 substantial account details of 106,000 high net wealth customers with over $100 billion is assets from 203 countries, and then soliciting tax departments with an emailed that the Wall Street Journal states included the subject line: “Tax evasion: client list available”. The theft of the bank data, reported at over 100 Gigabytes, has led to Mr. Falciani’s arrest in several countries, including Switzerland, France and Spain. But he has been spared extradition to Switzerland because of the French and Spanish courts found a public benefit from exposing HSBC’s widespread conspiracy to commit or at least enable tax fraud. Mr. Falciani has stated that he did not become a whistle blower for reasons of potential compensation. He has established a foundation to promote the protection of whistleblowers. Mr. Birkenfeld for a number of years willingly participated in the conspiracy of tax evasion with his clients, including most famously the California real estate billionaire Igor Olenicoff whom he brought into UBS from his previous employer. Regardless, because his cooperation indisputably led to the prosecution of UBS for conspiring to hide $20 billion of assets of 20,000 US taxable persons, in 2012 upon his release from prison (for his guilty plea to one count of tax evasion), the IRS awarded $104 million in whistleblower compensation to Mr. Birkenfeld.